Tim Freedman’s put about $10 in the pokies over the past five years, little wonder given the song. But don’t get him wrong, Freedman doesn’t mind gambling “as long as the odds are even fair, pokies are just a form of legislated losing”. 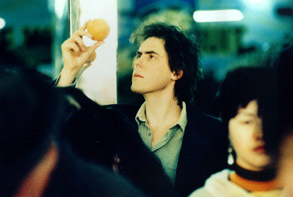 Amazingly, in an era where froth and bubble dominates the music scene, The Whitlams’ “thinking” single entered the charts at number 21. As with all new releases, Freedman has been diligently pushing the new single through all media, including The (very very live) Panel. Yes, Freedman still gets nervous. I assured him that he came across cool, calm and collected (although I did see him squirm when Rob Sitch brought up the uncanny similarity with Christopher Skase). But he’s fully recovered from that ordeal, the band’s well-rested having just had a month off. Freedman spent a month in his hometown, Newtown, at the local swimming pool. he’s now trying to imagine the next record in his mind, “and I haven’t got there yet so I don’t know where I’m going”. Sounds like the beginnings of something great. So far, he’s put four songs to paper, that have yet to be arranged, but this time Freedman wants to get as far away from Love This City as possible. He describes the last effort as “very painstaking and very pedantic”. But, with the album going platinum and Blow Up the Pokies becoming a standout commercial track, it paid off. “Love This City was quite an exhausting project, three producers there must’ve been four different bands on it. Setting up all the time rather than setting up just the once and getting into it, was a bit tiring. I intend to not spend six months on the next record, I’d rather just spend three and sit on the beach for the other three months – it’s best if it’s done quickly. Coming home, and it is a sort of home-coming for the band (the original line-up included the late Stevie Plunder and Andy Lewis from Narrabundah) is always a pleasure, Freedman says. Canberra watched the band grow up when they were “just a scrappy little three-piece playing at the ANU Bar.” An indication of how strong the band’s following is here can be seen in the number ofEternal Nightcap albums sold at Impact Records. It was the biggest-selling album ever, with 1600 albums sold from the one store. I guess tonight’s concert will attract the usual “Whitlams crowd” with an age group of 12 to 55 – The Whitlams are probably one of the few bands where people can come with their grandparents. So does the band maintain any contact with Gough – other than in name?